Why Youth Tennis Progression? Where Am I? How Do I Start? JTT? 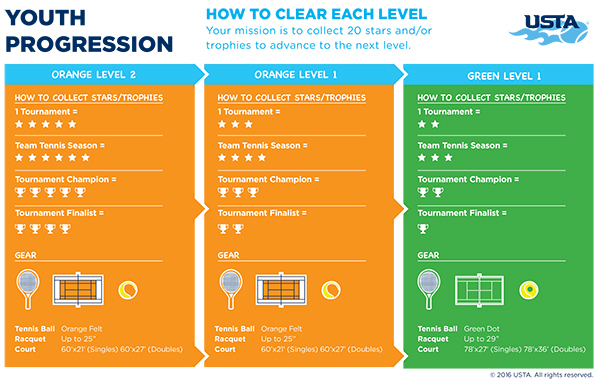 USTA has designed a best-in-class system to track the progress of junior players, ages 7 to10 from orange ball to green ball and green ball to yellow ball. The system will track a player’s progress through participation in designated tournaments and Junior Team Tennis. Players will receive stars for completing tournaments. Trophies are also awarded for select tournaments. Players can track their progress on their Player Profile Page. You can login by clicking here. The more they play and the more they improve their skills and clear each level, the more stars and trophies they accumulate. In an effort to provide a clear and skill-based pathway for junior players to progress though the USTA tournament system, Youth Tennis Progression will be implemented Jan 1, 2017 for all 10 and Under players in USTA Southern. Where am I on the Progression? USTA Southern tracks both participation (stars) and achievement (trophies) for players who have a USTA membership. If you are not a member, click here. All new players starting after January 1, 2017 will begin playing in Orange Level 2 tournaments. Players and parents can easily track progress through the progression by logging on to the Player Profile Page by clicking here. Enter the player's USTA number and password to be directed to the player's welcome screen. This screen will allow the player to access various items including his or her “Youth Tennis Progression Progress Report.” This will be available to Southern players beginning January 1, 2017. Progress is displayed as “trophies” for achievement and “stars” for participation. This page helps players, parents and coaches track progress and find upcoming play opportunities that fit a player’s age and skill level. Players must accumulate at least 20 stars and/or trophies to advance from level to level. Achievement trophies are awarded based on each state’s guidelines. Players must be a minimum age of 7 years old to register for 10 and Under tagged Youth Tennis Progression tournaments. On the first day of their 11th birthday month, players will automatically progress out of the system and into 12 and Under tournaments. Before the age of 7, players can play in unlimited practice matches, Play Days, Junior Team Tennis and junior tournaments using the red ball. Current players ages 6-10 who have been competing in tournament play will be grandfathered into the new Youth Tennis Progression based on their state singles points as outlined in the USTA Southern Grandfather Clause. How Is JTT Included on the Progression? 10s Advanced will use the green ball. JTT will continue to use their Advanced, Intermediate and Beginner Levels and placement will be determined by JNTRP along with the USTA Southern benchmarks. Players can play higher than their JNTRP. Players will receive Stars for JTT participation. Participation Stars for 10U players playing in a 10U division are automatically added to a players’ profile. If a 10U player participates in a 12U division of a Junior Team Tennis program, Participation Stars can be entered manually upon request. You can click here to submit the Participation Credit Request Form. 14U and 18U divisions are not available to 10U players.